From Ian Rankin’s phenomenally successful Rebus to the dark world of Tony Black’s Gus Dury, the capital is literally crawling with fictional detectives. Devoured by readers world-wide, there’s no shortage of stories revealing a lurid underbelly to the seemingly respectable city. So why, then, has Marianne Wheelaghan chosen to throw her own sleuth into the mix? “There are so many middle aged, white, male, alcoholic detectives – I wanted to write about a woman,” said Leith-born Marianne, 53. 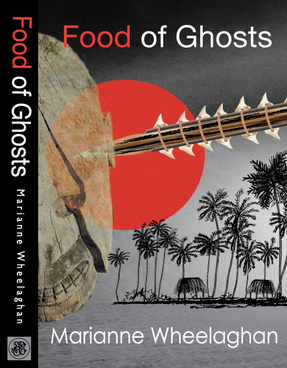 Her second novel and crime fiction debut – Food of Ghosts – follows Detective Sergeant Louisa Townsend as she struggles to solve the mystery behind a spate of killings. But rather than scouring Edinburgh’s dark alleys and underpasses in search of clues, Detective Townsend, from Leith, has just arrived on Tarawa, a coral atoll in the middle of the Pacific. “Because I’m from Edinburgh I want to write from what I know, but I think place is really important,” said Marianne, who spent ten years of her life living on islands in the Pacific, including Tarawa and Papa New Guinea. “Tarawa has a slightly dark, violent history and this mixture of aid workers and local people whose different cultures are rubbing each other all the time. 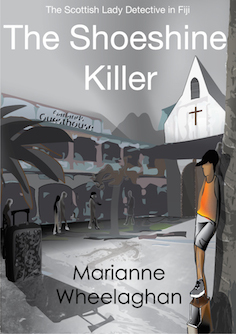 It was during her stay on Tarawa, where she moved with her family in the 1980s, that Marianne, a former drama teacher, experienced something that compelled her to write her first crime novel. “There was a terrible incident involving a friend – they died in a boating accident. It was tragic, awful, but the circumstances surrounding it I have always felt could have been avoided,” she said. “Everything there was rosy on one side, but there was another sinister side. Having these two communities rubbing together side by side is normally fine, but every now and then it creates odd behaviour. When she arrived back in Britain, Marianne enrolled in a Masters in creative writing, but before she could fulfil her crime fiction ambition, she was taken with another writing project, this time much closer to home. “Sometimes an idea can grab you and you can’t shake it off,” she said. “It took me so long to write Food of Ghosts because my mother died and after that I found some letters and diaries to do with her early life. “My mum was from Germany so I translated the letters for my dad after she died and ended up writing my first book. 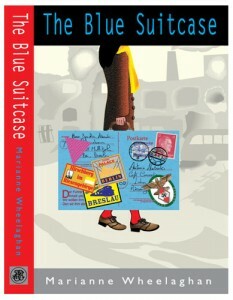 The Blue Suitcase is based on these but in the end I wrote a fiction, it was a sort of a hybrid. “My mum was from the part of Germany which became part of Poland during the Second World War, and Germans were forcibly expelled. She came to the UK and worked as a nurse but never talked about her life. “A lot of the letters were from my mum’s sister, who had married an Argentinean man and was very unhappy being so far away from home, so the character in the book, Antonia, is a mixture of my mum Gertrude and my aunt Antonia. Listed as a bestseller by Blackwell’s bookshop, the novel, which covers Gertrude’s life from 1932 to 1938, has enjoyed relative success, and, as Marianne says, will be followed up by a sequel accounting for her later years. In the meantime the mum-of-two is content cultivating the character of Louisa Townsend and her own love of crime writing, with up to five more books planned for a series following the detective’s cases set on various islands around the Pacific. “I always wanted to write a crime fiction because I think a really good crime novel can say as much as a literary novel,” she said. “When I was doing my masters it was frowned upon, but I think it’s accepted now. “I hope to space the novels two years apart, but it will always be Detective Lisa and her base will be Tarawa and she will end up being involved in all these crimes and cultures.